Following a tough few weeks Woking were victorious against Chester FC on Bank Holiday Monday with goals from Keiran Murtagh, Joey Jones and Gozie Ugwu. Despite the well drilled performance from the hosts’ Chester did deceive Woking of that illusive clean sheet as Ryan Lloyd was on hand for the visitors. With eight goals conceded and only three games played, defensive matters were heavily criticised going into the tie, which saw Hill make five changes. The most noticeable one was the return of Ishmail Yakubu. Going forward Woking looked a lot more alert and this showed in the opening seven minutes as Ben Gordon whipped in a lovely left footed cross only to be headed over the bar by Max Kretzschmar, who should have really got his attempt on target from such a short distance out. Chester’s left-back on the day, Johnny Hunt, really struggled with the pace and strength of Jake Caprice in the first half and this was quite clear in the opening half of the match. Caprice beat Hunt on numerous occasions but in this incident he didn’t have enough to guide his attempt into the back of the net as Worsnop scrambled his shot away. 16 minutes gone and Woking took the lead through a splendid goal from MOTM Murtagh. It was a powerful left footed strike from outside the 18 yard area that broke the deadlock. With Woking’s woes this season predominantly being from a defensive aspect, it was not a surprise when Chester got themselves back into the game when Ryan Lloyd flicked a header past Michael Poke and into the corner of the net following intense pressure from the visitors. However, it was short lived. Woking once again went ahead, Kretzschmar delivered a pin point free-kick into the Chester area and Jones headed in from five yards out. Chester repositioned and made changes at half-time as they tried to keep the attacking pressure from Woking at bay, but this never really developed for the visitors. 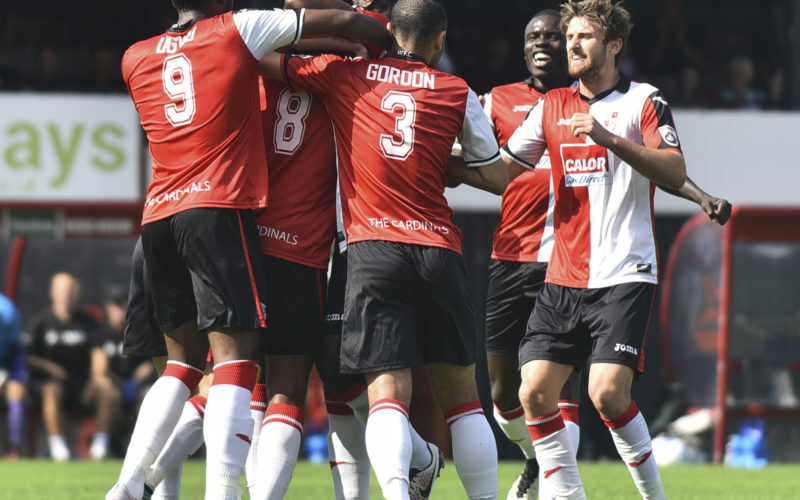 Woking continued to press on with the determined performance and right attitude. As Jones nodded on target only to be denied by a fine save from Worsnop. The visitors should have drawn level in the 58th minute, when Sam Hughes rose above his defender but headed over the bar. With the inclusion of substation Zak Ansah he nearly made a real positive contribution as he got on the end of a defensive error and broke through on goal but didn’t show any composure and cannoned his shot wide. The game was sealed in the 75th minute after some neat work from Caprice, again tearing down the right hand-side, he crossed low and hard, the ball fell to Ugwu who slammed home Woking’s third. It was what all Woking fans wanted, a hard thought victory. What made this victory greater than others was the attitude it was won in as the chants of support erupted around the Laithwaite Community Stadium. Coming into the clash Woking were at a very low point of confidence while Chester were off the back of a 4-0 thumping at Sutton united on Saturday. The return of Yakabu played a big factor, although he didn’t complete a full 90 minutes, he and Saah together showed a better level of defence and confidence than we’ve seen in recent weeks. Kicking out the reckless defensive mistakes and showing a real persistence to target the Chester goalkeeper paid off. One of those goal scorers Murtagh was sublime, playing alongside Kretzschmar and Lewis the three combined really well. However, despite all this some areas do need more work. Left-Back – Ben Gordan one area of his game is great. Going forward, but tracking back is something that faults the defender as he showed throughout the game many times he was left out of position and caught on the break from Chester. Radio Woking’s Star man: Keiran Murtagh – A wonderful performance from the midfielder. Gave a strong consistent account of himself. Great finish for Woking’s first goal too. Woking FC: Poke, Caprice, Gordon, Jones, Saah, Yakubu (Saraiva 78), Penny (Ansah 68), Murtagh, Ugwu, Kretzschmar (Carter 76), Lewis. Subs: Hall, Edgar. Chester: Worsnop, Horwood, Hunt (Durrell 46), Astles, Hudson (Hughes 46), Chapell (Akintunde 70), Lloyd, George, Shaw, Alabi, Richards. Subs: Roberts, Mahon.